That WASN’T a glass of lemonade! Really, I just could resist that face. 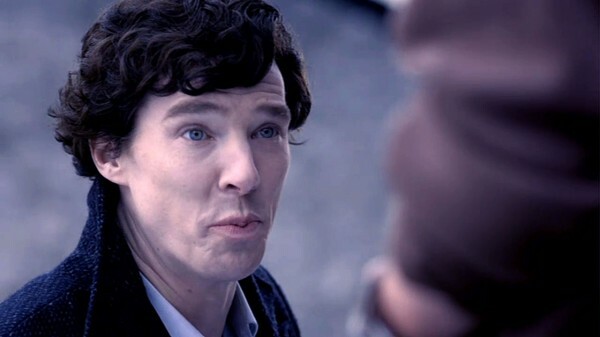 Benedict Cumberbatch has such a wonderfully mobile and expressive face. Please, Mr. Cumberbatch, don’t even consider Botox — EVER! And while we’re on the subject, what is wrong with all of these American actresses and performers (and I use the term loosely) making themselves look like plastic dolls, some even starting in their 20’s! Worse, the trend seems to be spreading. I mean look at the photos of Emmy nominated actresses and there’s Maggie Smith looking adorable and radiating charm and personality while all the other nominees in her category look like they’ve died and been embalmed. Even the smiles have a look of rictus. This entry was posted in Captions and tagged bbc sherlock, benedict cumberbatch, Mrs. Hudson, photo caption, Sherlock Holmes, Una Stubbs on September 23, 2012 by JH Watson.